On Sunday, March 31st the East Sac County High School Band and Choir, their directors and chaperones left for a long bus trip to Florida to experience the Disney World Parks and a Florida beach. 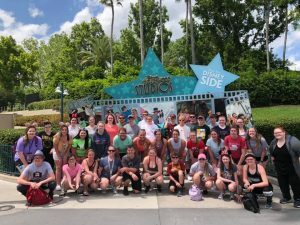 Students had the wonderful opportunity to experience a clinic with Disney clinicians and perform at a Disney venue as well as spend plenty of time at the “Happiest Place on Earth”. They also went to Epcot, Hollywood Studios, Hard Rock Cafe, Ron Jons, and Cocoa Beach. Besides a little sunburn and a very long ride home, everyone had a great time.